DASSAULT AVIATION STARTED MAKING BUSINESS JETS IN EARLY 1960S WHEN BUSINESS AVIATION IN THE US WAS JUST STARTING TO TAKE OFF. THE COMPANY’S LEADERS AT THE TIME HAD THE VISION TO SEE THAT BUSINESS AVIATION WOULD GROW TO BECOME A VERY SIGNIFICANT PART OF THE CIVIL AVIATION SECTOR. DASSAULT AVIATION ALSO UNDERSTOOD VERY EARLY ON HOW ADVANCED MILITARY TECHNOLOGIES COULD BE APPLIED TO IMPROVE THE PERFORMANCE AND CAPABILITIES OF CIVIL AIRCRAFT. BUSINESS AVIATION HAS GROWN BEYOND THE US AND EUROPE TO BECOME A TRULY GLOBAL BUSINESS. DASSAULT AVIATION CONTINUES TO BE AT THE FOREFRONT OF NEW DEVELOPMENTS IN THE FAST-DEVELOPING AND DYNAMIC GLOBAL BUSINESS AVIATION SECTOR. The 8X is Dassault’s flagship aircraft. What are some of the most attractive qualities? The 8X is the newest and largest Dassault business jet currently in production. This ultra long-range aircraft can fly 6,450nm (11,945km) non-stop. That’s enough range to fly non-stop from Beijing to New York, Hong Kong to London or Shanghai to Seattle. The 8X can also take off and land at airports with short runways. And it is capable of steep approaches up to six degrees, allowing it to serve challenging airports such as London City Airport and Lugano, Switzerland. These are airports that are normally not accessible to most large cabin aircraft. What does the three-engine design enable the 8X to do? The aircraft’s short take-off and landing capability is due, in part, to the three-engine configuration. Having three engines also means the 8X is permitted to fly more direct routes over water, because it is less constrained by the rules pertaining to extended twin-engine operations (ETOPs). For example, a three-engine aircraft flying from Sydney to Santiago, Chile is permitted to have a flight path that is 1,000nm shorter than what a twin-engine aircraft is permitted to fly. Dassault’s three-engine aircraft also have a lower fuel burn than two-engine models. This is because our aircraft have lighter, more fuel-efficient engines and a much lower maximum take-off weight (MTOW). The 8X’s MTOW is 73,000lb compared to around 100,000lb on competing aircraft. In aviation, higher weight equates to higher fuel burn. The 8X is up to 30% more fuel efficient than aircraft in the same size category. How does Falcon’s Combined Vision System enhance operational capability? Dassault Aviation was the first civil aircraft maker to have a head up vision system that combines enhanced vision with synthetic vision. It is military technology that we introduced to the civil aviation sector. Combined Vision System technology helps pilots to have better situational awareness in poor weather - such as fog, mist and snow — during day and night. In October, we announced that the European Aviation Safety Agency and US FAA had certified the 8X to use FalconEye for poor visibility approaches down to 100ft. 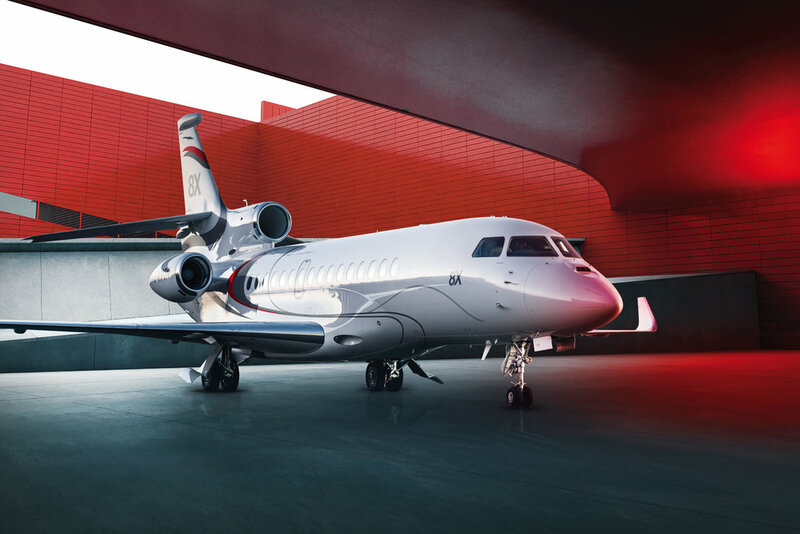 Dassault Aviation launched FalconConnect last May. What’s the significance of this? Connectivity is very important to the business jet customer. On board the aircraft people want to be able to use their personal devices and stay connected. We designed FalconConnect in partnership with Honeywell/GoDirect to provide a comprehensive and seamless service that is easy and less expensive to use, manage and control. In its early stages, the 6X has already been well-received. What can the industry expect from this aircraft? The 6X sets a new industry standard for comfort. It has the widest cross section of any purpose-built business jet. The cabin is 6ft 6in high, 8ft 6in wide and 40ft 4in long. The 6X can fly 5,500nm (10,186ft). That’s enough range to fly non-stop from Beijing to San Francisco, London to Los Angeles or Shanghai to Melbourne. When we launched the 6X program in Paris in February 2018 the image we used was a picture showing the aircraft flying over Hong Kong harbor. Though designed for the global market, the aircraft is perfectly well suited to Asian buyers, because of its high degree of cabin comfort and extended range. How does Dassault Aviation ensure owners are supported after the purchase of an aircraft? Dassault Aviation has a very comprehensive customer service network comprising of both Dassault-owned and authorized third party maintenance, repair and overhaul (MRO) centers. We deploy spare parts pools across the globe and a team of over one hundred Dassault field service reps. Our customer service engineers and experts are available 24/7. We also have a service called Falcon Broadcast that transmits data in real time via satcom from the aircraft to maintenance personnel on the ground. This allows maintenance teams to troubleshoot issues while the aircraft is airborne and be ready with the right spare part as soon as it touches down. The recent acquisition of TAG Aviation will strengthen our MRO network in Europe and also ensure further support for customers in that region. I am particularly excited about the acquisition of ExecuJet’s MRO businesses, because it expands the footprint of Dassault-owned service centres in emerging markets throughout the Asia Pacific, Africa, and Middle East regions. Within the Asia Pacific, ExecuJet has a big MRO facility in Kuala Lumpur and several in Australasia-- Melbourne, Sydney, Perth and Wellington. Which market is Dassault Aviation most optimistic about? China is still the biggest market in Asia Pacific for business aviation, but we have always been very active in other parts of the region, as well. This strategy has proven good for us because this year we have seen Southeast Asia and Australasia do very well for us — markets such as Australia, New Zealand, Thailand and Malaysia have all been growing. We also recently sold two business jets in Vietnam, a country that is just emerging as a market for business aviation. We have sold a number of 7X aircraft in China over the years and are seeing a lot of interest in that market for our 8X and 6X aircraft as well. We are a major exhibitor at ABACE and we will have several aircraft on display there in April, including the 8X. I am very positive about the longer-term outlook for China. Many Chinese companies have become truly global players. Chinese executives are driven, and they want to achieve a lot and in the most efficient manner. If you are doing business around the country and around the world, the way to work most productively and time-efficiently is to use a business jet. There is a fundamental need for business aviation in China, so my longer-term outlook remains positive. Overall, we continue to be optimistic about several markets throughout the region.